Corruption is at an all-time high in India with no respite in sight. Every day the newspapers carry depressing stories about the way justice is subverted. This is not to say that we do not have people who are willing to take a stand against this gross perversion of ethics. In Goa, a small group has come together to make the effort to bring about a change. They call themselves Generation Next. A small group of individuals have come together under the presidency of Durgadas Kamat, who is the state secretary and chairman of the Information and Technology Cell of the Indian National Congress in Goa. The executive members are Chander Mohan Bhatia, Raymond Pereira, Yemane D’Souza, Angela Naik and Felix Goes. There is a host of young members who are geared up to carry on this crusade against corruption to the next generation. The group has no political affiliations but uses its connections to see that justice is meted out albeit on a small scale. There have been other groups that have been formed but have become inactive or have dissolved as enthusiasm dies down when goals are not met. ‘We decided that we needed to start something that would last. We named it Generation Next because it is meant to benefit the future generation. This generation is facing a lot of hardships in Goa. We hope the next generation will be happy with what we accomplish,’ says former teacher Anita D’Abreu. Advocate Yemane D’Douza is one of the key members of Generation Next as he co-ordinates all the activities of the group. Help in the area of information technology comes from Raymond Pereira, a Goan located in the gulf region. Angela Naik is an international Taekwondo referee, who is bent on exposing any corruption that occurs in the sports quarters. The organisation was inaugurated with an appropriate ceremony with the media in attendance. The formal opening contributed to the determined tone the members wished to subscribe to in carrying on their operations. Their first big case was the unearthing of the laxity and corruption at the Valpoi Police Training School. 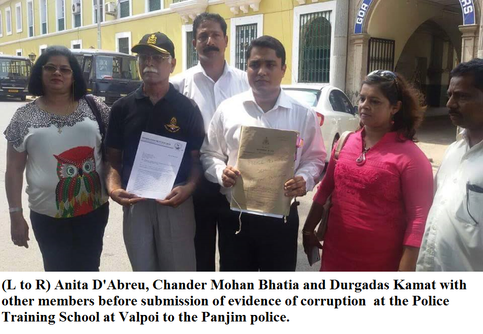 ‘We submitted the information we collected to the police in Panjim. And the truth is coming out today,’ says Anita. She recalls how the proof about the PTS scam was mysteriously burned but they had copies of the documentation and continue to persist in their efforts in bringing about change. Durgadas Kamat has helped women who were manhandled by a policeman while they were on strike at GMC (Goa Medical College) to obtain justice. The organisation halted the establishment of four land based casinos and have reached out to citizens in their time of need, which includes property matters as well. Anita talks of a case where an elderly couple was hoodwinked by the bank from which they had taken a loan. The property papers of their mortgaged shop were exchanged for a higher loan by the bank without their knowledge. Eventually the shop was taken over by another person. The couple came to Generation Next, frantically searching for a solution. The work is still in progress. Anita deplores the blatant chicanery perpetrated against the elderly couple, who also happen to be childless. Right now, the work is more on a smaller scale rather than tackling gargantuan issues, however, the momentum is slowly building up in that direction. It seems like a tough proposition, taking on corrupt individuals with powerful connections but Anita says, ‘When you are focused on an idea and having views from different people makes it easy.’ The larger portion of credit goes to Durgadas Kamat for acquiring necessary information and spearheading various issues. While people can avail of aid from Generation Next, there is the anticipation that the public will join forces in their own way by not succumbing to facilitating corruption to meet their own ends. With able support, Generation Next will definitely scale great heights in achieving chalked out goals.